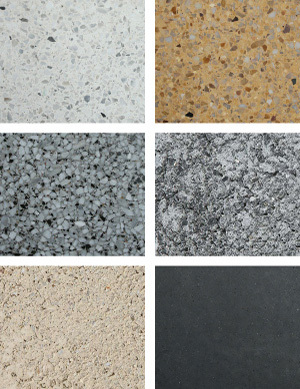 Select virtually any cement, pigment and aggregate to create a distinctive surface for High Performance Insulated Wall Panels and Insulated Architectural Cladding. This online course explains and illustrates how high-performance, fully composite insulated sandwich wall panels can be detailed to achieve continuous insulation. 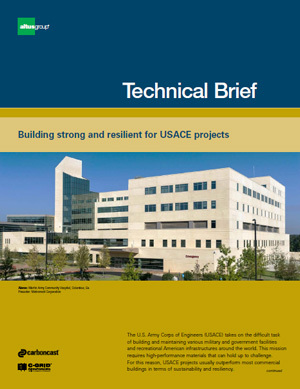 The U.S. Army Corps of Engineers (USACE) takes on the difficult task of building and maintaining various military and government facilities and recreational American infrastructures around the world. This mission requires high-performance materials that can hold up to challenge. This eight-page brochure provides a wealth of information about CarbonCast Double Tees, including a LEED point checklist and basic CarbonCast Double Tee sizing chart. Reduced weight, increased benefits. CarbonCast Double Tees are patented lightweight floor and roof deck framing components used primarily for high-performance parking and outdoor decks. The components are constructed with a C-GRID® reinforced epoxy coated carbon fiber open strand mesh face and steel prestressing strand reinforcing. The specification details manufacture, transportation, handling, erection and other related items such as anchorage, bearing pads, storage and protection of the units. Download (doc, 59.5 KB) | or use SpecLink-E. 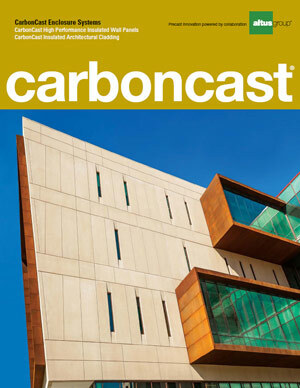 This 16-page brochure features information on CarbonCast High Performance Insulated Wall Panels and CarbonCast Insulated Architectural Cladding. It includes inspirational project photography, example detail drawings and an overview of finish options. Setting a new standard for sandwich wall panels CarbonCast® High Performance Insulated Wall Panels are patented, structural precast concrete insulated wall panels with prestressing strands and/or mild steel reinforcement, C-GRID® carbon fiber shear grid and welded wire steel mesh or C-GRID epoxy-coated carbon fiber open strand mesh. The panels can act as either load bearing or non-load bearing building elements including shear walls. This specification details their manufacture, transportation, handling, erection and other related items such as anchorage, bearing pads, storage and protection of the units. Download (doc, 81.5 KB) | or use SpecLink-E.
Thermally efficient, lightweight, durable. 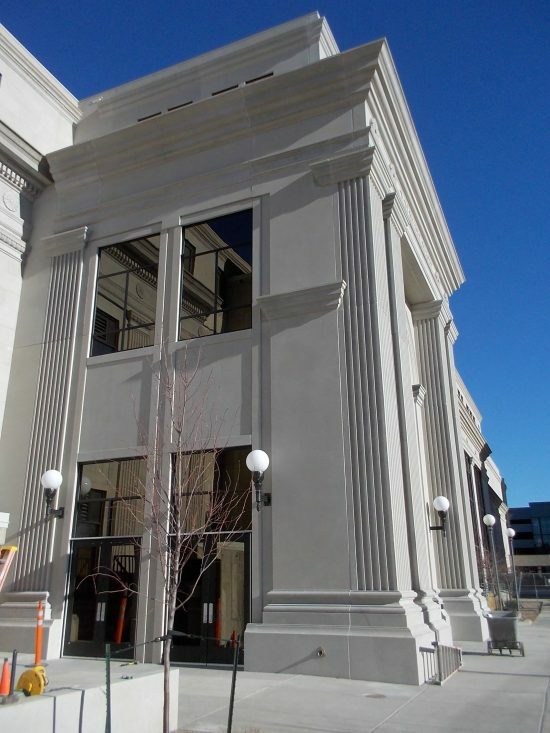 CarbonCast Insulated Architectural Cladding is architecturally finished load bearing or non-load bearing insulated precast concrete wall panels, reinforced with prestressing strands, mild steel reinforcement, and welded wire steel mesh or epoxy-coated carbon fiber open strand mesh.Specifications include manufacture, transportation, handling, erection, and other related items such as anchorage, bearing pads, storage and protection of the units. Download (doc, 66.0 KB) | or use SpecLink-E. Designing and building for the military can be challenging and demanding. In an effort to safeguard the public’s money, government-funded projects are typically accompanied by extensive regulations, rigorous processes and exhaustive bidding processes. This paper examines the suitability of CarbonCast products to meet stringent military demands. 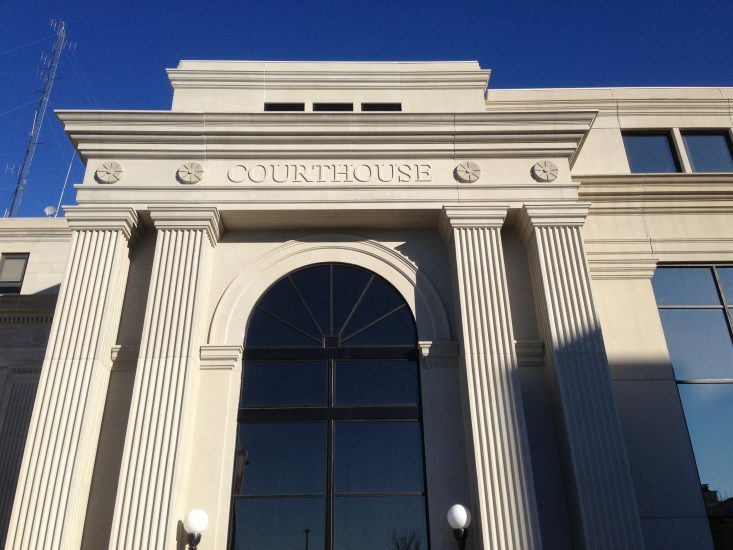 Precast is a favored building material for educational facilities because of its long-term durability and construction speed. In addition, CarbonCast Enclosure Systems provide continuous insulation to meet ASHRAE codes and enable a reduction in energy costs. 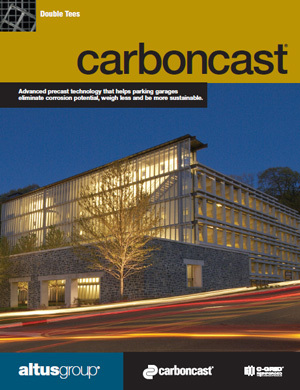 This brief also discusses aesthetic options and acoustic benefits of CarbonCast products. 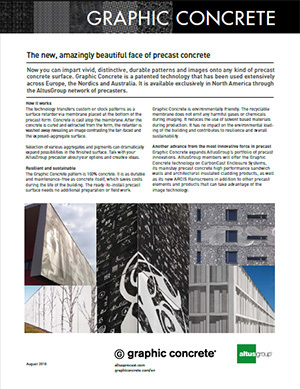 This information sheet provides an overview about the Graphic Concrete treatment to impart designs, patterns and images onto the face of precast concrete wall panels. It includes FAQs about designing and fabricating with the Graphic Concrete technology. 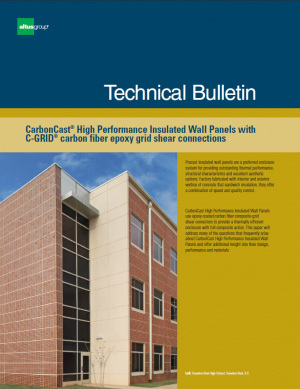 This bulletin explains the unique properties of CarbonCast High Performance Insulated Wall Panels, including their C-GRID® carbon fiber grid connector systems, continuous insulation properties, composite performance, and more.